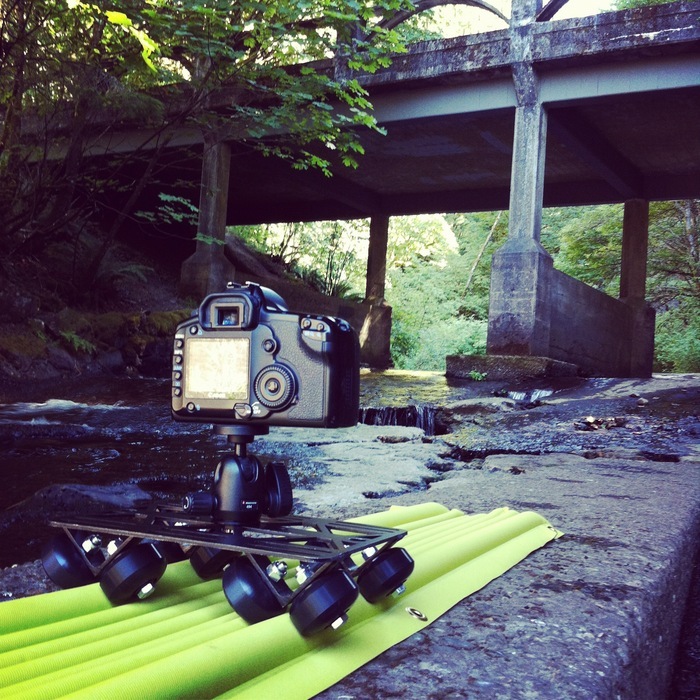 I recently purchased one of the more affordable camera slider options on the market, the Dot Line DLC 47″ slidler. It arrived just in time for me to take it along on a shoot in rural Nebraska. It performed very well, and got the job done. The big drawback is finding a way to travel with a 47″ piece of aluminum that doesn’t come with a protective case. If the thing gets dented or bent in any way, it’s useless. That smooth movement you need comes from the aluminum bars being in perfect shape. So I wrapped it in a cloth backdrop I had laying around, and put it inside a long bag from a light stand. This added an extra bag to travel through the airport with (or check at the ticket counter for $25). I’m glad I took it, but the experience left me thinking —there has to be a more portable solution. I’m not creating Hollywood productions, after all. Well, my prayers were half answered (typical) last night when I ran across this little item on Kickstarter. It’s called AirTracks and it’s an inflatable slider solution that has me drooling. There’s no long rail to haul around, because the “rail” is an inflatable surface a dolly rolls over. It’s practical. It’s portable. It’s just what I need. The only problem is that the Kickstarter campaign is now over, so I’ll have to wait until they become available to the public. Still, there’s hope for not hauling a four-foot aluminum rail through airport security again.